Background: Cellular level of enzyme activity can serve as a reliable biomarker in the event of environmental/chemical insults. Objectives: The present study investigated time-dependent alterations of erythrocyte glutathione S-transferase (Ery-GST) activity of non-malarious guinea pigs (Cavia tschudii) administered with pyrimethamine/sulfadoxine and artemether/lumefantrine combination therapies. Materials and Methods: Eighteen guinea pigs were divided into three groups of six, composed of the control (C1) and two test groups- T1: pyrimethamine/sulfadoxine treated group and T2: artemether/lumefantrine treated group. Accordingly, single dose intra-peritoneal injections equivalents of mixture of pyrimethamine = 3.7 mg/kg bw and sulfadoxine = 0.7 mg/kg bw was administered to T1, whereas a mixture of artemether = 0.3 mg/kg bw and lumefantrine = 1.8 mg/kg bw was administered to T2. The animals were not fed for 16 hours prior to treatment and blood samples were drawn at time intervals of three, six, nine and 24 hours and measured for GST activity using spectrophotometric methods. Results: The Ery-GST activity of group C1 (C1GST) within 0 ≤ t ≤ 24 hours was fairly constant and did not exhibit significant alterations (P > 0.05); whereas the Ery-GST activity profile of the test groups (T1 and T2) were biphasic. Ery-GST activity of group T1 (T1GST) varied with a range of 5.04 ± 0.98 to 5.60 ± 0.59 IU/gHb with peak enzyme activity at t = 0. At t = 9 hours, T2GST activity was not significantly different (P > 0.05) from T1GST activity. Conclusions: The Ery-GST activity profile indicated perturbation of erythrocyte physiochemistry, which could be of relevance from toxicological and therapeutic standpoints. Combination therapy of sulfadoxine (50 mg) and pyrimethamine (250 mg) exist under the trade mark name of FansidarTM, often administered as prophylaxis and for treatment of certain chloroquine resistant strains of Plasmodiumfalciparum malaria (1). This drug combination effectively inhibits two enzymes involved in the biosynthesis of folinic acid within the parasite (2, 3). Sulfadoxine (NI-(5, 6-dimethoxy-4-pyrimidinyl) sulfanilamide) is a structural analogue of para-aminobenzoic acid (PABA) that competitively inhibits protozoan dihydropteroate synthetase (DHPS), the enzyme required for incorporation of PABA into dihydropteroic acid and immediate precursor of folic acid. The resultant depletion of folic acid, an essential cofactor in the biosynthesis of nucleic acids, interferes with the protozoan nucleic acid and protein biosynthesis (3). Sensitive malarial parasites are those that must synthesize their own folic acid, whereas those that can utilize existing folate are not affected. Pyrimethamine (5-(4-chlorophenyl)-6-ethyl-pyrimidine-2, 4-diamine) is a competitive inhibitor of dihydrofolate reductase (DHFR), the enzyme that reduces dihydrofolate to tetrahydrofolate (FH4), required for one of the carbon transfer reactions. Since malaria parasites do not incorporate exogenous thymine or thymidine for DNA synthesis, thymidylate must be synthesized de novo in a process that requires active FH4. The inhibition of this pathway effectively interferes with DNA synthesis in the malaria parasite with attendant deleterious consequences. The combination of artemether and lumefantrine is available from Novartis under the brand name CoartemTM. It is the most effective available treatment for malaria of children in African areas where resistance to conventional antimalarial drugs is high (1). CoartemTM is currently the only fixed-dose artemisinin-based combination therapy (ACT) pre-qualified by the World Health Organization (WHO) (4). This fixed-dose combination is beneficial for patients as it facilitates treatment compliance and supports optimal clinical effectiveness. The two active principles of CoartemTM show synergistic anti-protozoan activity against P. falciparum and a 1:6 ratio of artemether and lumefantrine has been described as optimal in vitro (3-5). Artemether therapeutic action depends on its endoperoxide bridge, which interacts with haem irons to cause free radical mediated damage to malaria parasites (6, 7). Lumefantrine most likely interferes with haem polymerization, which is an obligatory and critical detoxifying pathway in malaria parasites (5). Both agents have secondary actions that probably include inhibition of parasite nucleic acid and protein synthesis (8). The concept of combination therapy is based on the synergistic or additive potentials of two or more drugs to improve therapeutic efficacy and delay the development of resistance to the individual components of the drug combination (1). The glutathione S-transferases (GSTs) activity among other functions (9, 10) catalyzes the transfer of reduced glutathione (GSH) to reactive electrophiles. The GST activity pathways serve to protect cellular macromolecules from the deleterious effects of reactive oxygen and nitrogen species (RONS), which in turn ensure cellular functionality and structural integrity (9, 11, 12). Several GST isoforms exist in different tissue/organ types (9, 13) with remarkable high occurrence in the liver, kidney and intestine (10, 14). Studies have shown that human erythrocyte glutathione S-transferase (Ery-GST) isoforms are immunologically distinct from human hepatocytes GST isoforms (15). At present, the physiological role of Ery-GST is not fully known yet there are suggestions that the presence of GST in erythrocytes is ideal for the detoxification and elimination of circulating xenobiotics (10, 13). There are also indications that Ery-GST functions physiologically as a haemin-binding and/or transport protein in developing erythroid cells (14). Protein binding studies have shown that Ery-GST appears to bind haemin with an affinity equal to, if not greater than that of hepatocyte GST; the so-called ligandins or GST-B. Ligandins have been posited to be responsible for the transport of haem from mitochondria to cytoplasm (14, 16). However, bilirubin appears to be a poor substrate for Ery-GST compared to hepatocyte GST isoforms (17). These reports affirmed GST binding and transport, functions in concurrence with its catalytic actions. Previous studies have reported the correlation between GST activity and level of exposure of human and animal models to xenobiotics and pathogens (9, 10, 12, 18, 19). The reproducibility and reliability of GST activity, to serve as a biomarker in the event of environmental/chemical insults, informed the use of Ery-GST activity as an index to ascertain the level of distortion in erythrocyte physiochemical status of guinea pigs administered with pyrimethamine/sulphadoxine and artemether/lumefantrine combination therapies. The present study will give insight into time-dependent alterations of Ery-GST activity of animal models following the administration of two antimalarial combination therapies as prophylaxis. The two antimalarial drugs, FansidarTM (Swiss (Sipha) Pharmaceuticals Nigeria Ltd) and CoartemTM (Beijing Norvatis Pharmaceutical Company, Beijing, China), were purchased from Cympok Pharmaceuticals, Owerri, Nigeria. Tablets of the two antimalarial drugs, each weighing 2 g, were pulverized separately into powder by using a ceramic mortar and pestle. The two ground drug samples were suspended separately in 50 mL of phosphate buffer saline (PBS) solutions (pH = 7.4) and allowed to stand in a water bath at thermostatically controlled temperature of 25 ± 5 °C under continuous agitation for 30 minutes after which the mixtures were separated using Whatman No 24 filter paper. Healthy non-malarious, 8-10 week-old male guinea pigs (Cavia tschudii), weighing 550-600 g, were generously gifted by Professor A.A. Uwakwe (Department of Biochemistry, University of Port Harcourt, Nigeria). The guinea pigs were maintained at room temperature (25 ± 5 °C), 30-55% relative humidity and on a 12-hour light/dark cycle, with access to distilled water (DW) and standard commercial feed (SCF) (Ewu Feed Mill, Edo State, Nigeria) ad libitum for a two-week acclimatization period. The institutional review board of the Department of Biochemistry, Imo State University, Owerri granted approval of this study. The handling of the animals was in accordance with the standard principles of laboratory animal care of the United States National Institutes of Health (NIH, 1978). • Group T1; guinea pigs received pyrimethamine = 3.7 mg/sulfadoxine 0.7 mg mixture/kg bw; i.p. • Group T2; guinea pigs received artemether = 0.3 mg/lumefantrine = 1.8 mg mixture/kg bw; i.p. Blood samples were drawn from the anterior region of the guinea pigs, using a hypodermic syringe, at time intervals of three, six, nine and 24 hours post-treatment, for analyses. The blood volumes obtained were transferred into test tubes containing PBS solution (blood to PBS ratio 1:4; v/v). The blood suspension was subjected to bench centrifugation for 10 minutes. The pelleted erythrocytes were washed by methods described by Tsakiris et al. (21) and Chikezie et al. (22). Within two hours of collection of blood specimens, 0.5 mL of harvested erythrocytes was introduced into centrifuge test tubes containing 3.0 mL of buffer solution (pH = 7.4: 250 mM tris (hydroxyl methyl) amino ethane–HCl (Tris-HCl)/140 mM NaCl/1.0 mM MgCl2/10 mM glucose). The erythrocyte suspension was further centrifuged at 1200 g for 10 minutes and this was repeated 3 times. According to Chikezie (23), the pelleted erythrocytes were re-suspended in 3.0 mL of PBS solution and passed twice through newly packed columns (3.5 cm in a 30 mL syringe) of cellulose-microcrystalline cellulose (ratio 1:1; w/w) to obtain erythrocyte suspension sufficiently devoid of leucocytes and platelets (24). Finally, the erythrocyte suspension was stored at 4°C and lysed by freezing/thawing as described by Galbraith and Watts (25) and Kamber et al. (26). The erythrocyte hemolysate was used for the determination of Ery-GST activity. The cyanomethaemoglobin reaction modified method of Baure, (27) as described by Chikezie et al. (22) was used for measurement of hemolysate hemoglobin concentration. A 0.05 mL portion of erythrocyte hemolysate was added to 4.95 mL of Drabkin’s reagent (100 mg NaCN and 300 mg K4Fe(CN)6 per liter). The mixture was left to stand for 10 minutes at 25 ± 5°C and absorbance was measured with a spectrophotometer (Digital Blood Analyzer®; SPECTRONIC 20, Labtech) at λmax = 540 nm against a blank. The absorbance was used to evaluate hemolysate hemoglobin concentration by comparing the values with the standards. The Ery-GST activity was measured by the method of Habig (28) as described by Pasupathi et al. (29) with minor modifications according to Chikezie et al. (22). The reaction mixture contained 1.0 mL of 0.3 mM phosphate buffer (pH = 6.5), 0.1 mL of 30 mM 1-chloro-2, 4-dinitrobenzene (CDNB) and 1.7 mL of DW. After pre-incubating the reaction mixture at 37°C for 5 minutes, the reaction was started by the addition of 0.1 mL of erythrocyte hemolysate and 0.1 mL of GSH substrate. Absorbance was measured at time intervals of 30 seconds, for 5 minutes at λmax = 340 nm. The Ery-GST activity was expressed by the international unit of per gram hemoglobin (IU/gHb) using an extinction coefficient (∑) of 9.6 mM-1 cm-1 in a reaction mixture in which 1 mole of GSH was oxidized (Equation 1). OD/min = Change per minute with absorbance at 340 nm. VC = Cuvette volume (total assay volume) = 3.0 mL. VH = Volume of hemolysate in the reaction system (0.05 mL). h = Time intervals in hours. y = Ery-GST activity (IU/gHb) at corresponding time interval. The results were expressed as mean ± SEM, and statistically analyzed by one way ANOVA followed by Dunnett’s test, with level of significance set at P < 0.05. An overview of Table 1 showed that within 0 ≤ t ≤ 24 hours, Ery-GST activity of group C1 (C1GST) was fairly constant and did not exhibit significant alterations (P < 0.05). Conversely, Ery-GST activity of group T1 (T1GST) varied within the range of 5.04 ± 0.98–5.60 ± 0.59 IU/gHb with peak Ery-GST activity at the commencement of the experiment (t = 0 hour) (Table 1). In addition, T1GST activity showed lower enzyme activity relative to C1GST activity. Specifically, at t ≥ 6 hours, T1GST activity was significantly (P < 0.05) lower than C1 GST activity, whereas no significant difference (P > 0.05) was exhibited at t ≤ 3 hours. The lowest T1GST activity was registered at t = 9 hours, which represented 90% relative enzyme activity compared to T1GST activity at t = 0. (Figure 1). aThe results are Mean ± SD. bMeans are not significantly different at P > 0.05. A look at Table 1 shows that at t = 0, T1GST and T2GST activities were not significantly different (P > 0.05) from C1GST activity. Similarly, at t = 9 hours, T2GST activity was not significantly different (P > 0.05) from T1GST activity. The lowest T2GST activity was at t = 3 hours, which corresponded to 79.93% relative Ery-GST activity post-treatment (Figure 1). Generally, within 0 ≤ t ≤ 24 hours, Ery-GST activity of the three experimental groups was in the following order: C1 > T1 > T2. Figure 1 shows that the Ery-GST activity profile of the test groups (T1 and T2) were biphasic, and T1GST and T2GST activities were lower compared to C1GST activity. For instance, within the experimental time of 24 hours, t < 9 hours represented the inhibition phase of T1GST activity followed by the enzyme recovery phase, exemplified by relative increase in T1GST activity at t = 9 hours by 3.97% compared to T1GST activity at t = 24 hours (P < 0.05). Likewise, t < 3 hours represented decreasing T2GST activity, whereas t > 3 hours showed progressive increase in T2GST activity relative to pre-treatment time at t = 0 (Figure 1). The cumulative Ery-GST activity profile and capacity of the two drugs to alter erythrocyte enzyme activity in the various experimental groups are presented in Table 2. Thus, area under the curve (AUC 0 ≤ t ≤ 24 hours) showed that the level of alterations in T1GST activity was comparable to T2GST activity and was significantly different (P < 0.05) from C1GST activity. Cellular levels of GST activity have immense application for providing insights into the etiology and diagnosis of diverse pathologic states and for monitoring toxicological and therapeutic events. There are reports on over-expression of GST in erythrocytes of individuals with chronic renal failure with attendant uremia (30) and hyperbilirubinemia (13). Also, toxicological studies of human erythrocytes exposed to heavy metals (31) and rainbow trout erythrocytes incubated in aminoglycoside antibiotics in vitro (32) as well as animal models exposed to particulate matters (11), gas substances, aromatic/organic chemicals in situ (18) showed that there were decreased levels of Ery-GST activity in a dose/concentration dependent manner. Furthermore, the activities of redox enzymes, Ery-GST activity inclusive, serve as reliable biomarkers in environmental and toxicological studies. For instance, Ery-GST activity has previously been employed as a tool for assessing levels of pesticide contamination (33) and exposure to pollutants involving two crustacean species: water flea Daphnia magna and terrestrial isopod Porcellio scaber (34) as well as fish (Cyprinus carpio. L) (35). The present study has equally shown that non-malarious guinea pigs administered FansidarTM and CoartemTM exhibited reduced levels of Ery-GST activity, which was a spinoff effect of the biotransformational pathways of the drugs in vivo. The concerted role of cellular GST and cytochrome P450 superfamily in the metabolism of xenobiotics and pathogenic metabolites has been described elsewhere (10), which serves to explain the basis for the pattern of Ery-GST activity of the present study. Also, from the present study, the subsequent time-dependent increasing levels of Ery-GST activity (recovery phases) after initial decay/attenuation of enzyme activity (inhibition phase) was in a manner similar to those earlier reported by Ayalogu et al. (36). They noted that rats injected with gasoline exhibited early short-term low activity of GST, which also affirmed the outcome of the study by Chiarpotto et al. (37) on inactivation of GST activity by different concentrations of acetaldehyde. 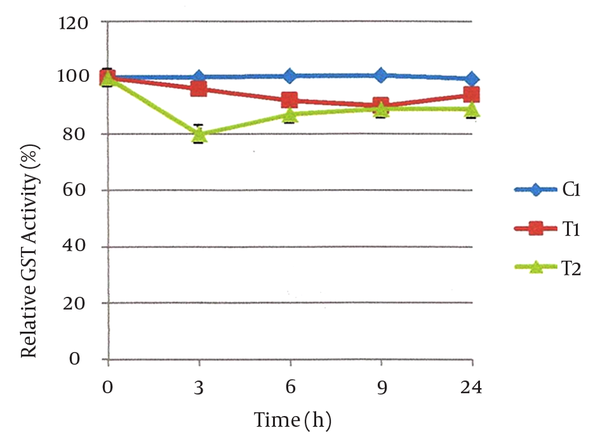 Their study further suggested that detoxification process and eventual systemic clearance of the causative metabolites accounted for the subsequent increasing levels in GST activity of rats administered with kerosene and crude oil (bonny light) as the experimental time progressed. Rathore et al. (38) had reported a similar characteristic pattern for GST activity in oxidative stressed rats induced by the administration of isoproterenol. They noted that inactivated GST activity partially recovered 12 hours after the administration of isoproterenol in efforts by the antioxidant system to counteract and ameliorate oxidative stress. The capability of artemether, lumefantrine and sulfadoxine to generate RONS as reported elsewhere (3, 5, 7, 8, 22) could be responsible for the time-dependent biphasic Ery-GST activity profile of guinea pigs administered with pyrimethamine/sulfadoxine and artemether/lumefantrine combination therapies. The initial decreasing levels of Ery-GST activity was related to the consumption of GST cofactor-GSH, one of the first lines of antioxidant defense mechanism against xenobiotics, which might have accounted for depletion of intracellular GSH with resultant decreasing levels of relative Ery-GST activity (9, 12, 19). However, increasing levels of Ery-GST activity after the initial inactivation phase, occasioned by low levels of GSH among other factors, could have prompted the positive activation and up-regulation of the redox enzymes in an effort to restore homeostasis and prevent cellular damage (39); consequent upon the propensity of these chemical agents to overwhelm cellular antioxidant system. More recently, reports have shown that xenobiotics promote the expression and activation of transcriptional factors, particularly the nuclear factor erythroid-2 (Nrf2) that has been implicated in up-regulation of antioxidant enzymes (40). The processes leading to up-regulation of redox enzymes are to ensure that the cell is equipped with adequate and sustainable quantity of requisite antioxidant enzymes for neutralization of potentially noxious chemical agents. The findings of the present study showed that Ery-GST activity of non-malarious guinea pigs administered with pyrimethamine/sulfadoxine and artemether/lumefantrine combination therapies gave a characteristic biphasic profile. The perturbation of erythrocyte physiochemistry of non-malarious guinea pigs administered with pyrimethamine/sulfadoxine and artemether/lumefantrine combination therapies was typified by the disparities in cumulative Ery-GST activity (IU/gHb h-1) among the experimental groups (C1, T1 and T3), which could be of relevance from toxicological and therapeutic standpoints. Special thanks to Professor A.A. Uwakwe for the generous gift of experimental rats.